Boiler Services Dublin are the experts for everything you need to know about different types of boilers pros and cons. We find that the average person doesn't really know too much about boiler repair, replacement or boiler servicing. This is why we always want to help and inform you where we can so if you need a boiler replacement you get what you need and not necessarily what someone is trying to sell you. Types of boilers pros and cons. Please read on this article is to enlighten you and assist you in making the decision that suits you when you need a new boiler. Condensing boilers, The Different Types. On the market today there are three main types of condensing boiler: The combi boiler,The heat-only boiler and The system boiler. In this article we will talk about the types and the advantages and disadvantages of each boiler type. These are currently the most popular boiler type for gas central heating. A combi boiler supplies heat for your radiators and provides domestic hot water on demand. It is named “combi” because it combines the functions of a traditional boiler. It has a cold water tank and a hot water cylinder. It comes in one standalone unit this makes them quite simple to install. When you require hot water you just turn on the tap. The water is taken directly from the mains supply, it then is heated in the boiler and comes out of your tap. It is possible to get a storage combi boiler if you require a small back up supply of hot water. • You have an unlimited supply of hot water instantaneously. There is no waiting time for a hot water cylinder to refill..
• For a smaller household or small business with low hot water usage it is an economical choice. • A small compact heating system. 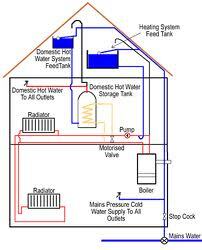 There is no need for a hot water cylinder a cold storage tank or airing cupboard leaving more space in the house..
• As the water is direct from the mains supply all taps provide drinking water. • Combi boilers produce up to 18 litres of water a minute (when the cold water is heated up by 35°C). • It is possible to run a powerful shower off the bath taps. • They are not suitable for large homes were you may require many sources of water at the same time as they only provide maximum pressure through one water supply outlet at a time. • There can be a delay in getting hot water from a tap as the burner on your combi boiler needs to warm up. • Combi boilers are slow to run and fill a bath and can’t supply hot water quickly enough for power showers. • They don’t have an immersion heater. This means there is no back up hot water if you have an issue with the gas supply or boiler. Heat only boilers are the heart of most of the older heating systems. Heat only boilers provide heat for radiators directly. They also produce hot water which is stored in a separate hot water cylinder. In nearly all cases cold water is normally supplied by a cold water cistern. This will usually be located in a loft or attic above the boiler and uses a gravity feed, there is also a separate expansion cistern. Advantages of heat only boilers. • You can use many water supply outlets at once because you have a large tank full of hot water..
• It’s great for large households with a high demand for hot water. • If you need to replace it , this can be done easily as there are few changes to pipework. Disadvantages of heat only boilers. • They take up a large amount of space in comparison to Combi boilers. • Not great for energy efficiency, a cylinder can lose a lot of heat to the nearby areas unless extremely well insulated. • The amount of hot water is limited to the size of the cylinder. • The water pump for the heating and hot water systems is separate, therefore extra space is required. A system boiler has 2 tanks similar to an open-vent boiler, this takes up extra space. The principle is for hot water storage. 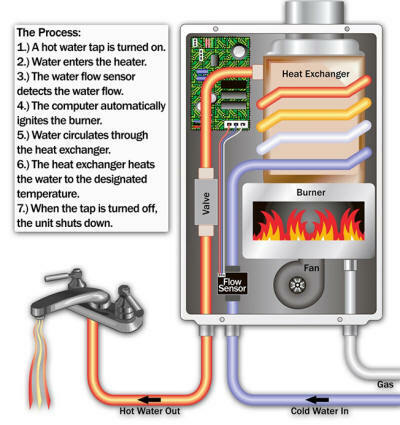 Many of the individual components of the hot-water and heating are built into a system boiler. The system boiler doesn’t require the need for a feed and expansion cistern. 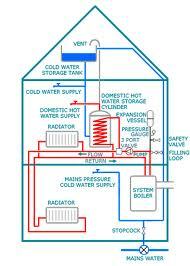 There is though the need for a cold water tank (unless you have a pressurised hot water cylinder). This would be recommended for a modern family home where every inch of space for storage is required and has a high demand for hot water. • Many taps can be used at once as there is a large tank of hot water. • You don’t require an expansion tank in the loft or the feed in to it. • It can be used with pressurized cylinders. This means there is no requirements for a cold water tank in the loft. • Excellent for a large house with a heavy demand for hot water. • The pump is integrated in a system boiler This means a fast response and economical running costs. • It takes up more space than a combi boiler system. • Not as energy efficient unless the cylinder is very well insulated. It can lose heat into the surroundings area. • You are limited to the amount of hot water you can use by the cylinder size. You may run a bath for example and then have to wait for the water to heat up again to run another for example. If you require professional advice on a boiler replacement call the experts today on 01-8326699. We are delighted to offer advice and a free no obligation quote. For all your standard general plumbing requirements please contact our sister company plumbers Dublin.